TOKYO -- A baby girl who was sleeping when a deadly quake rocked Japan was rescued unscathed early Friday after a six-hour rescue operation. The eight-month old was pulled out of the rubble of a collapsed house in the southeastern town of Mashiki. 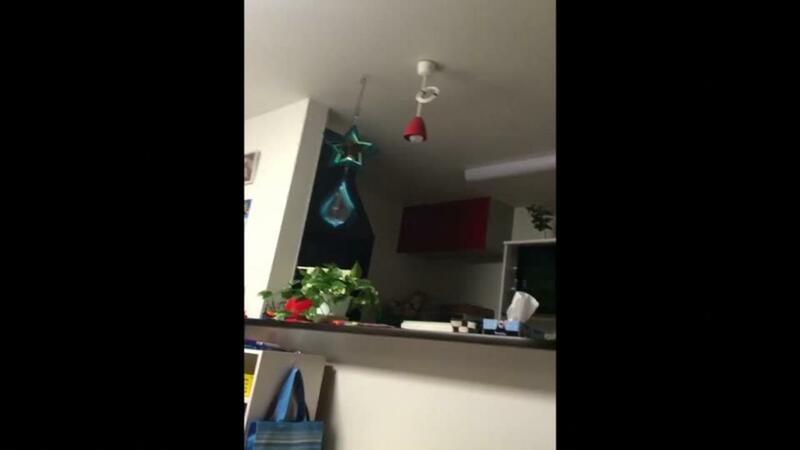 The tot was on the first floor when a 6.5-magnitude earthquake struck on Thursday night, police told NBC News. Her mother, grandparents, and 4-year-old brother were in the kitchen and living room at the time, according to Japan's Mainichi newspaper. An eight-month-old baby (C) is carried away by rescue workers after being rescued from her collapsed home caused by an earthquake in Mashiki town, Kumamoto prefecture, southern Japan, April 15, 2016 early morning, in this handout video image provided by Kumamoto Prefectural Police. REUTERS/Kumamoto Prefectural Police/Handout via Reuters ATTENTION EDITORS - FOR EDITORIAL USE ONLY. NOT FOR SALE FOR MARKETING OR ADVERTISING CAMPAIGNS. NO RESALES. NO ARCHIVE. THIS IMAGE HAS BEEN SUPPLIED BY A THIRD PARTY. IT IS DISTRIBUTED, EXACTLY AS RECEIVED BY REUTERS, AS A SERVICE TO CLIENTS. MANDATORY CREDIT. 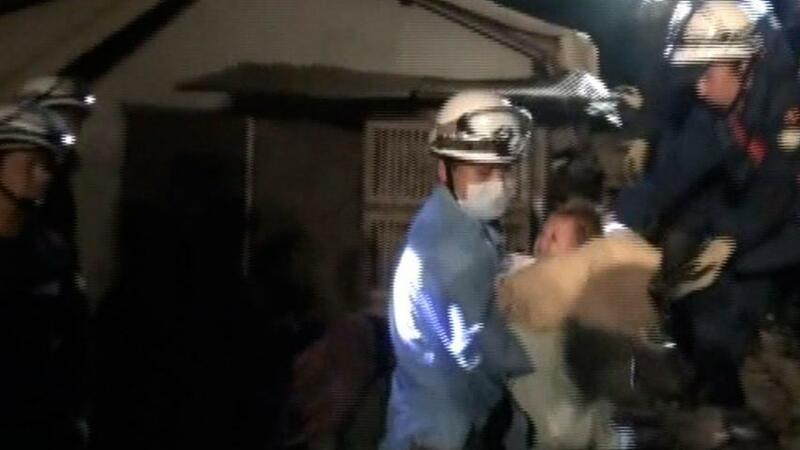 An eight-month-old baby is carried away by a rescue worker after being rescued from her collapsed home caused by an earthquake in Mashiki town, Kumamoto prefecture, southern Japan, April 15, 2016 early morning, in this handout still image from a video provided by Kumamoto Prefectural Police. REUTERS/Kumamoto Prefectural Police/Handout via Reuters ATTENTION EDITORS - FOR EDITORIAL USE ONLY. NOT FOR SALE FOR MARKETING OR ADVERTISING CAMPAIGNS. NO RESALES. NO ARCHIVE. THIS IMAGE HAS BEEN SUPPLIED BY A THIRD PARTY. IT IS DISTRIBUTED, EXACTLY AS RECEIVED BY REUTERS, AS A SERVICE TO CLIENTS. MANDATORY CREDIT. Nippon TV reported that crossbeams from the home's roof collapsed around the baby and created a cavity that protected her. Following the quake, the girl's mother could see her daughter through a small crevice but could not reach her. A team of around 50 people climbed on the roof and began to dig down. Hotel guests gather at the lobby after another earthquake hit the area in Kumamoto, southern Japan, in this photo taken by Kyodo April 16, 2016. Mandatory credit REUTERS/Kyodo ATTENTION EDITORS - FOR EDITORIAL USE ONLY. NOT FOR SALE FOR MARKETING OR ADVERTISING CAMPAIGNS. THIS IMAGE HAS BEEN SUPPLIED BY A THIRD PARTY. IT IS DISTRIBUTED, EXACTLY AS RECEIVED BY REUTERS, AS A SERVICE TO CLIENTS. MANDATORY CREDIT. JAPAN OUT. NO COMMERCIAL OR EDITORIAL SALES IN JAPAN. A woman reacts at a health and welfare center acting as an evacuation center after an earthquake in Mashiki town, Kumamoto prefecture, southern Japan, in this photo taken by Kyodo April 15, 2016. Mandatory credit REUTERS/Kyodo ATTENTION EDITORS - FOR EDITORIAL USE ONLY. NOT FOR SALE FOR MARKETING OR ADVERTISING CAMPAIGNS. MANDATORY CREDIT. JAPAN OUT. NO COMMERCIAL OR EDITORIAL SALES IN JAPAN. THIS IMAGE WAS PROCESSED BY REUTERS TO ENHANCE QUALITY, AN UNPROCESSED VERSION WILL BE PROVIDED SEPARATELY. Evacuees gather in front of the town office building after an earthquake in Mashiki town, Kumamoto prefecture, southern Japan, in this photo taken by Kyodo April 15, 2016. Mandatory credit REUTERS/Kyodo ATTENTION EDITORS - FOR EDITORIAL USE ONLY. NOT FOR SALE FOR MARKETING OR ADVERTISING CAMPAIGNS. THIS IMAGE HAS BEEN SUPPLIED BY A THIRD PARTY. IT IS DISTRIBUTED, EXACTLY AS RECEIVED BY REUTERS, AS A SERVICE TO CLIENTS. MANDATORY CREDIT. JAPAN OUT. NO COMMERCIAL OR EDITORIAL SALES IN JAPAN. A collapsed house is seen after an earthquake in Kumamoto, southern Japan, in this photo taken by Kyodo April 15, 2016. Mandatory credit REUTERS/Kyodo ATTENTION EDITORS - FOR EDITORIAL USE ONLY. NOT FOR SALE FOR MARKETING OR ADVERTISING CAMPAIGNS. THIS IMAGE HAS BEEN SUPPLIED BY A THIRD PARTY. IT IS DISTRIBUTED, EXACTLY AS RECEIVED BY REUTERS, AS A SERVICE TO CLIENTS. MANDATORY CREDIT. JAPAN OUT. NO COMMERCIAL OR EDITORIAL SALES IN JAPAN. Local residents wrap themselves in blankets as they sit on the road after they are evacuated from their home after an earthquake in Mashiki town, Kumamoto prefecture, southern Japan, in this photo taken by Kyodo April 15, 2016. Mandatory credit REUTERS/Kyodo ATTENTION EDITORS - FOR EDITORIAL USE ONLY. NOT FOR SALE FOR MARKETING OR ADVERTISING CAMPAIGNS. THIS IMAGE HAS BEEN SUPPLIED BY A THIRD PARTY. IT IS DISTRIBUTED, EXACTLY AS RECEIVED BY REUTERS, AS A SERVICE TO CLIENTS. MANDATORY CREDIT. JAPAN OUT. NO COMMERCIAL OR EDITORIAL SALES IN JAPAN. Broken dishes are seen at a restaurant after an earthquake in Kumamoto, southern Japan, in this photo taken by Kyodo April 14, 2016. Mandatory credit REUTERS/Kyodo ATTENTION EDITORS - FOR EDITORIAL USE ONLY. NOT FOR SALE FOR MARKETING OR ADVERTISING CAMPAIGNS. MANDATORY CREDIT. JAPAN OUT. NO COMMERCIAL OR EDITORIAL SALES IN JAPAN. THIS IMAGE WAS PROCESSED BY REUTERS TO ENHANCE QUALITY, AN UNPROCESSED VERSION WILL BE PROVIDED SEPARATELY. Police told NBC News that the girl was freed at around 3:45 a.m. (2:45 p.m. ET Thursday) -- six hours after the family called emergency services. She had not been injured. At least nine people were killed, more than 800 were injured by Thursday's earthquake. More than 134 aftershocks had been reported by 3 p.m. Friday (2 a.m. ET), officials said.